I swear I had seen this movie. I knew the story, I knew about the stellar performance of Christopher Lee in one of his few turns as a good guy. An intense good guy, but a good guy all the same. So when I sat down to watch it last night imagine my surprise when I realized I had not seen it at all. I think I was confusing it with another Christopher Lee movie. In any case The Devil Rides out is fantastic. A nice little battle with the forces of evil. Hammer based on the book by occult writer Dennis Wheatley. 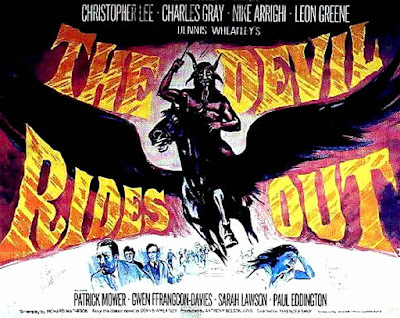 It would not be the last time that Hammer and Christopher Lee would collaborate on a Dennis Wheatley tale, this time putting Lee back in the role of bad guy for To The Devil A Daughter. The feel to this movie is very much like the book Tanith. In fact the book of The Devil Rides Out was one of the influences on Tanith. Each features a central character named Tanith and also deals with rural England paganism and/or satanism. There is so much here for a game. Occult secrets, cultists, magical battles. You can also do worse than model your clerics after Lee. Plus I am dying to role up a new witch named Tanith that may or may not be involved in devil worship. This reminds me how much I love Hammer Films. As I understand it, this movie played a huge role in how Dave and Gary developed cleric spells for D&D. So this movie has direct and major roots to our hobby! This is on my list for the challenge.